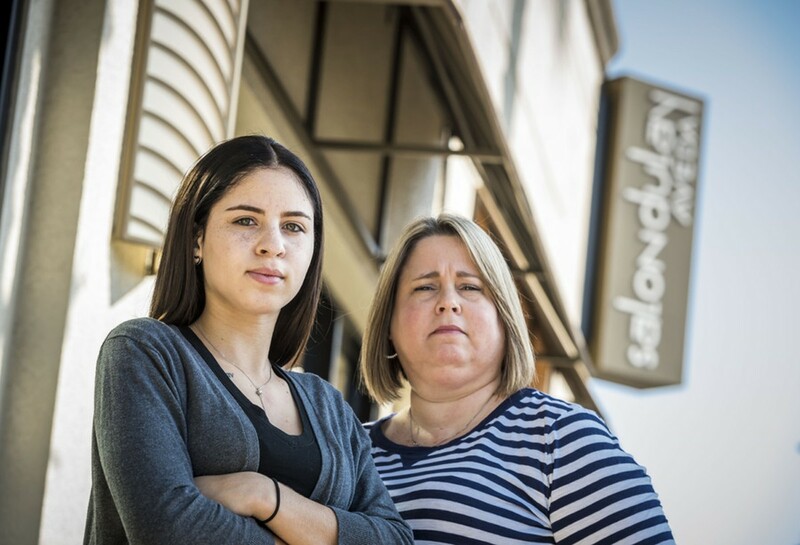 Jacquline Haas and her mother, Jennifer, in Windermere, Florida. School officials nationwide dodge accountability ratings by steering low achievers to alternative programs. In Orlando, Florida, the nation's tenth-largest district, thousands of students who leave alternative charters run by a for-profit company aren't counted as dropouts. Tucked among posh gated communities, and meticulously landscaped shopping centers, Olympia High School in Orlando offers more than two dozen Advanced Placement courses, even more after-school clubs, and an array of sports from bowling to water polo. U.S. News and World Report ranked it among the nation's top 1,000 high schools last year. Big letters painted in brown on one campus building urge its more than 3,000 students to "Finish Strong." Olympia's success in recent years, however, has been linked to another, quite different school five miles away. Last school year, 137 students assigned to Olympia's attendance zone instead attended Sunshine High, a charter alternative school run by a for-profit company. Sunshine stands a few doors down from a tobacco shop and a liquor store in a strip mall. It offers no sports teams and few extra-curricular activities. Sunshine's 455 students -- more than 85 percent of whom are black or Hispanic -- sit for four hours a day in front of computers with little or no live teaching. One former student said he was left to himself to goof off or cheat on tests by looking up answers on the internet. A current student said he was robbed near the strip mall's parking lot, twice. Sunshine takes in cast-offs from Olympia and other Orlando high schools in a mutually beneficial arrangement. Olympia keeps its graduation rate above 90 percent -- and its rating an "A" under Florida's all-important grading system for schools -- partly by shipping its worst achievers to Sunshine. Sunshine collects enough school district money to cover costs and pay its management firm, Accelerated Learning Solutions (ALS), a more than $1.5 million-a-year "management fee," 2015 financial records show -- more than what the school spends on instruction. But students lose out, a ProPublica investigation found. Once enrolled at Sunshine, hundreds of them exit quickly with no degree and limited prospects. The departures expose a practice in which officials in the nation's tenth-largest school district have for years quietly funneled thousands of disadvantaged students -- some say against their wishes -- into alternative charter schools that allow them to disappear without counting as dropouts. "I would show up, I would sit down and listen to music the whole time. I didn't really make any progress the whole time I was there," said Thiago Mello, 20, who spent a year at Sunshine and left without graduating. He had transferred there from another alternative charter school, where he enrolled after his grades slipped at Olympia. 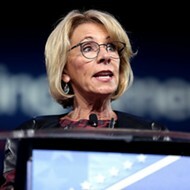 The role of charter alternative schools like Sunshine -- publicly funded but managed by for-profit companies -- is likely to grow under the new U.S. Secretary of Education, Betsy DeVos, an ardent supporter of school choice. In her home state of Michigan, charter schools have been responsible in part for a steep rise in the alternative school population. 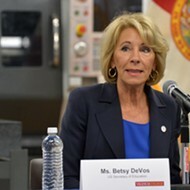 She recently portrayed Florida as a national model for charters and choice. In Orlando, both traditional and alternative charter schools manipulate the accountability system. The charters exploit a loophole in state regulations: By coding hundreds of students who leave as withdrawing to enter adult education, such as GED classes, Sunshine claims virtually no dropouts. State rules don't label withdrawals for that reason as dropping out. But ALS officials cannot say where Sunshine students actually went -- or if they even took GED classes at all. Between the day in 2012 when it first opened, and the end of the 2015 school year, Sunshine High coded 1,230 withdrawals as students leaving for adult education. At least nine of the company's other charter schools statewide -- including three in Orange County -- followed a similar pattern. Not counting Sunshine, the other ALS schools in Florida reported 5,260 more such withdrawals. ALS ran seven of the 10 high schools statewide with the most withdrawals to adult education in 2015. Sunshine ranked first. If all such withdrawals from ALS schools in Florida were counted as dropouts, the number of times that students quit school statewide that year would increase by at least 5 percent. In Orange County, the number of dropouts would jump by at least 80 percent. The apparent suppression of the dropout rate occurred as Orlando's district, Orange County Public Schools, geared up to win a major national education award. 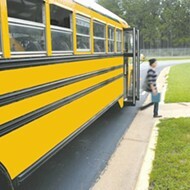 In a written statement, district officials disputed that the transfers helped elevate the school system's standing under state accountability rules. Students who quit to pursue adult education do count against the district's overall graduation rate, even though they aren't labeled as dropouts, they said. They did not respond to questions about whether transfers to Sunshine and other alternative charters have inflated the graduation rates of traditional schools like Olympia. "Any national or state recognition the district has received," the statement said, "is the direct result of our parents, students, teachers, and school administrators working hard. "I can't even begin to say we have this all figured out," she said while giving ProPublica a tour of Aloma High, another charter school the company runs in Orange County. "But every day we get better at it." "You go in there with bad habits and you're already going 'at your own pace,'" said Mello, who graduated from a regular high school in Texas and now works as a mechanic in a suburb of Dallas. "It doesn't work like it's intended to work." The symbiotic relationship between Olympia and Sunshine sheds light on a neglected sector of American K-12 education: a sprawling system of "alternative" schools made up of roughly half a million of the nation's most vulnerable students. No Child Left Behind was supposed to improve educational outcomes for students long overlooked -- including those who were black, Hispanic and low-income. Yet as the pressure ramped up, ProPublica's analysis found, those students were precisely the ones overrepresented in alternative classrooms -- where many found a second-tier education awaiting them. Barbara Fedders, a law professor at the University of North Carolina-Chapel Hill, said alternative schools too frequently fail to halt students' downward trajectory, simply isolating them, instead. "They create little islands of segregation," Fedders said. "If they aren't doing what they're supposed to do, it's unclear why we have them at all." The alternative sector's new focus on academic struggles also created a niche that charter school groups sought to fill, including for-profits like ALS. Supporters of alternative schools say they provide more support for struggling students, and the best do -- through small classes, caring teachers, flexible schedules and extra counseling and tutoring. Arkansas, for instance, has devoted "tremendous resources" to lower student-teacher ratios, specialized teacher training and project-based learning in its alternative program, said Lori Lamb, the state's director of alternative education. But a broad swath of the schools short-change their students, ProPublica's analysis of federal data shows. Nationwide, nearly a third of the alternative-school population attends a school that spends at least $500 less per pupil than regular schools do in the same district. Forty percent of school districts with alternative schools provide counseling services only in regular schools. Charter alternative schools -- both virtual and bricks-and-mortar -- in Ohio, Georgia and Florida have been accused of collecting public money for students who weren't in classes. "What was done in the alternative programs was just shameful," said Leon Smith, a lawyer at the Center for Children's Advocacy, which has pushed for reforms in Connecticut. In that state, a survey of alternative education a few years ago revealed substandard facilities and programs that offered fewer class hours than regular schools did. "If you do it right, you can catch those kids and get them through," Smith said. "If you do it wrong, it's a dumping ground." One day in early 2014, Jacquline Haas was sitting in chemistry class at Olympia High when she was summoned to the guidance counselor's office. A quiet student who had never been in trouble, she nervously left class. Jacquline was shaken, disappointed by the idea of leaving Olympia -- especially given her encouraging tour of the vocational program earlier in the day. "It just kind of popped my bubble," she said. To Jennifer Haas, the message was clear: Her daughter was not welcome at Olympia because of her borderline grades and test scores. 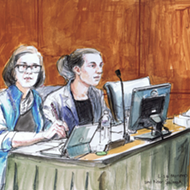 The year before, Haas had provided school counselors ample information on her daughter's type of Attention Deficit Hyperactivity Disorder, including a professional evaluation. She felt the school had responded by trying to push Jacquline out. "I said, 'Jacq you're too smart to go to these,'" Haas recalled telling her daughter after looking through the school brochure. "You're just hanging in the crack. They'd rather you go all the way through the crack to protect their numbers." Those numbers include standardized test scores, graduation rates and the letter grades schools in Florida receive each year. In some cases, funding is tied to the results -- and, in all cases, so are the reputations of the school and the professionals who run it. "Everybody wants these high graduation rates because it ties in to your school grade," said Amy Geller, a former registrar at Olympia. "It is a huge deal to schools, it affects property values, it affects everything." Olympia has done particularly well. The school's leaders boast on its website that the school is the only one in the district to receive an "A" rating from the state for seven straight years. Its graduation rate of 93 percent is among the highest in the school district. The state's strict graduation criteria require most students to maintain a 2.0 GPA, pass certain standardized tests and obtain 24 credits to graduate. "They called us up to a classroom, all the kids that were doing bad and everything," said Justin Cowans, a senior, after class ended at Sunshine High earlier this school year. He transferred out of Olympia last school year, he said, after a counselor told him he "had to leave the school because of my grades." The transfers of thousands of students like Cowans from traditional schools have spurred explosive growth in Orange County's alternative high school population. ProPublica's analysis of federal data shows that the district's alternative school enrollment tripled from 1,300 students in the 2009 school year to 3,900 in 2014. A driving force: Sunshine and its sister Accelerated Learning Solutions schools -- Sheeler, Chancery and Aloma. A fifth ALS school, Econ River, opened last fall. Few students earn diplomas on time from the ALS schools, whose low graduation rates are a drag on Orange County's districtwide average. But by labeling students who left as transfers to adult ed programs such as GED classes, the ALS schools kept thousands of departures from being listed officially as dropouts. Orange County only reported 211 dropouts in 2015. That same year, countywide, its ALS schools reported 1,038 adult education withdrawals. The transfers likely helped the school district's test scores, too. The academically at-risk students who attend ALS schools tend to score below their counterparts at Olympia and other traditional schools. But they inflict less damage on the district's average scores at Sunshine because it tests a smaller percentage of eligible test takers -- the group that matters for accountability purposes -- than Olympia does. While Olympia tested 95 percent of such students in 2016, Sunshine tested just 80 percent, state data shows. Another ALS school in Orange County, Sheeler High, tested only half of its eligible students. Regular high schools in Orange County likely enjoyed the biggest benefit of the exodus. Evans, Edgewater, and West Orange high schools saw jumps of more than 10 percentage points in their graduation rates between the 2011 and 2014 school years. The 14 percentage point boost in Evans' graduation rate over that period coincided with a substantial exodus of students from its neighborhoods to ALS schools. In 2014, district data obtained through a public records request shows, 170 students assigned to Evans' zone attended Sunshine, and 101 went to Sheeler. "I was slacking off at my old school," said Angel Hernandez, while waiting for a ride after class at ALS's Sheeler High northwest of Orlando early in the school year. Hernandez, then 19, said he attended West Orange High until staff there suggested to his parents that he transfer to Sheeler or Sunshine to catch up. Olympia, which already had a high graduation rate, didn't experience a comparable boost. Still, it saw sharp hikes in the rates for subsets of students similar to those that frequently end up in ALS schools. The graduation rate for Olympia's low-income population rose by 7 percentage points between the 2012 and 2016 school years, for instance. The rate for its disabled students increased by 18 percentage points. In their statement, school district officials noted the district's overall graduation rate, which includes the performance of the charter alternative schools, has risen in recent years. "We are committed to student success and providing all students with options that lead them to graduation," the statement said. The school district declined a request by ProPublica to speak with Superintendent Barbara Jenkins. In November, Jenkins was named Florida's Superintendent of the Year. ALS President Whitford-Narine said in a statement that enrollment trends "do not suggest that students are referred for any reason other than because an educational professional and the student and parent believe that an alternative learning environment is needed." The alternative education boom occurred as Orange County Public Schools -- which serves more than 200,000 students, two-thirds of whom are economically disadvantaged -- sought national recognition. The district in 2014 was one of two nationwide awarded the annual Broad Prize for Urban Education, then considered by some to be the Nobel Prize for large public school systems. (The Eli and Edythe Broad Foundation suspended the Prize in 2015, citing "sluggish academic results" by the nation's biggest school districts.) Selection jurors praised Orange County not only for raising students' achievement across grade levels, but for doing so at a rapid pace. "Orange County demonstrates that a sense of urgency and focus can improve student achievement in a hurry," Broad Foundation president Bruce Reed said at the time. The award put the district and school leaders in the spotlight as exemplars of urban school reform and brought Orange County students $500,000 in scholarships. The award was no happy accident: District and school board officials had made a deliberate, multi-year push for the Broad -- a journey some districts have called the "Road to Broad." 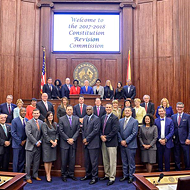 "We thought it would take us four to five years just to become a finalist, and two to three more to win the Broad Prize," wrote Bill Sublette, chairman of the Orange County school board, in the district's 2015 annual report. "Remarkably, under the capable leadership of Superintendent Barbara Jenkins, last year we were named the 2014 Broad Prize winner!" 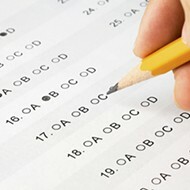 In response to questions from ProPublica, analysts working with the Broad Foundation said that, after reviewing the data, they saw no evidence that moving students to alternative charter schools boosted the Orange County district's overall testing performance inappropriately, according to a statement released by the foundation. Award jurors did not consider the dropout rate when making the award, they said.